Apple will make ATS mandatory by Jan 1st 2017. What about my Admob ads? During Apples WWDC, the company revealed the deadline for all apps in its App Store to switch to App Transport Security (ATS) by January 1st, 2017. Like a lot of indie developers trying to earn revenue from iOS apps, I decided to implement Google’s Admob ads into my app to generate revenue. Google encouraged developers to disable ATS to prevent third party ads from being blocked. You can read about that here. When the news about Apple’s mandate hit, I quickly began searching for a solution for display Admob’s ads in my apps with ATS enabled. 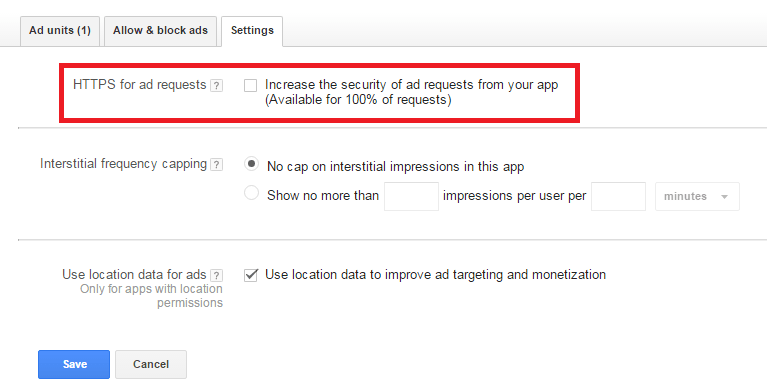 It turns out that Admob already supports ads being served over HTTPS. It simply has to be enabled in your ad settings. Disaster averted.